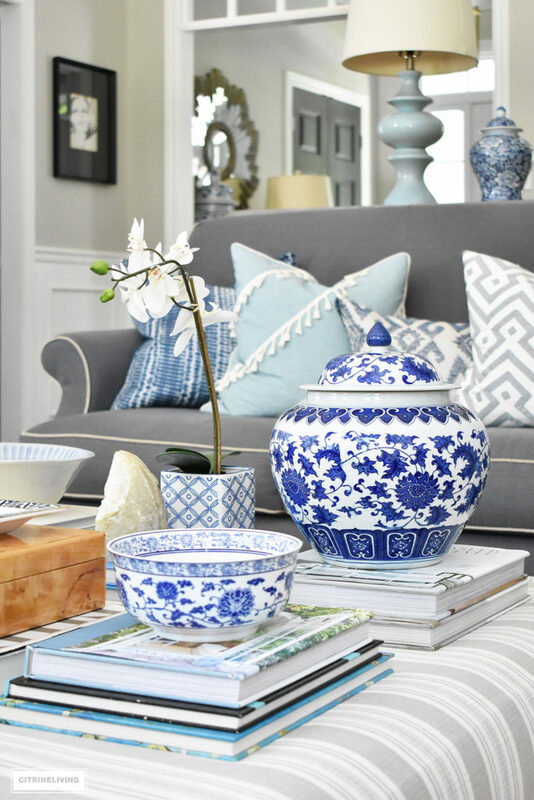 I’ve talked to you so many times about decorating with the things you love around your home, and then redecorating again, again and again. 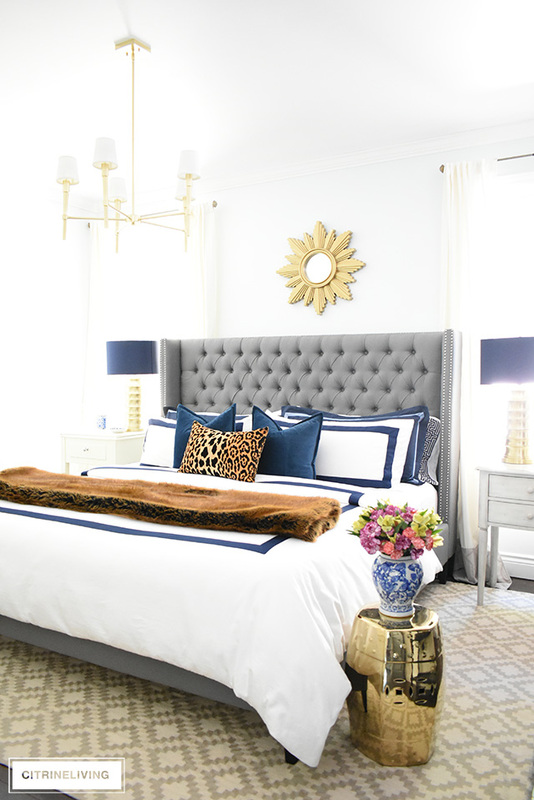 As a designer, decorator and blogger, I’m continuously looking for new and different ways to switch things up around our home. It’s really like a studio in here – I’m shooting for blog posts on a regular basis, always bringing in, and rotating different ‘props’ for different stories. My husband and kids have gotten very used to it by now…they know when to ask if something is for shooting or if it can be moved, or of the sofa can be flopped on haha. 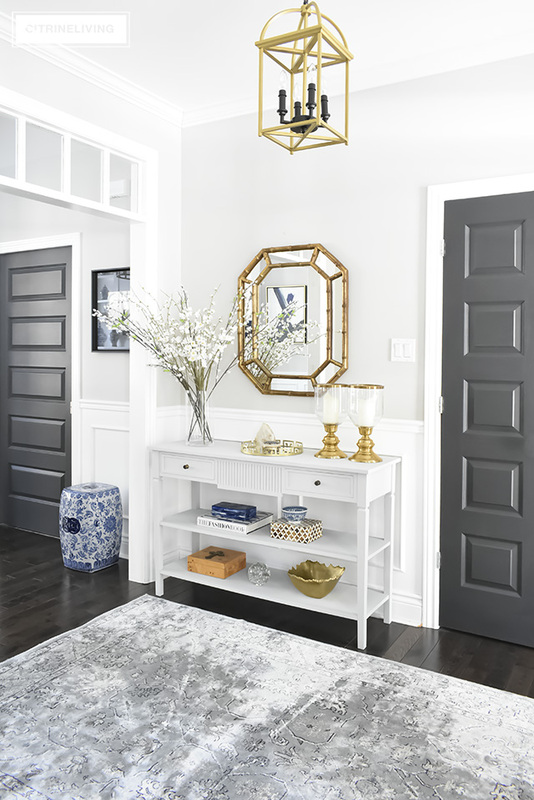 In a recent post, I shared the different ways to style a console table (read it here). 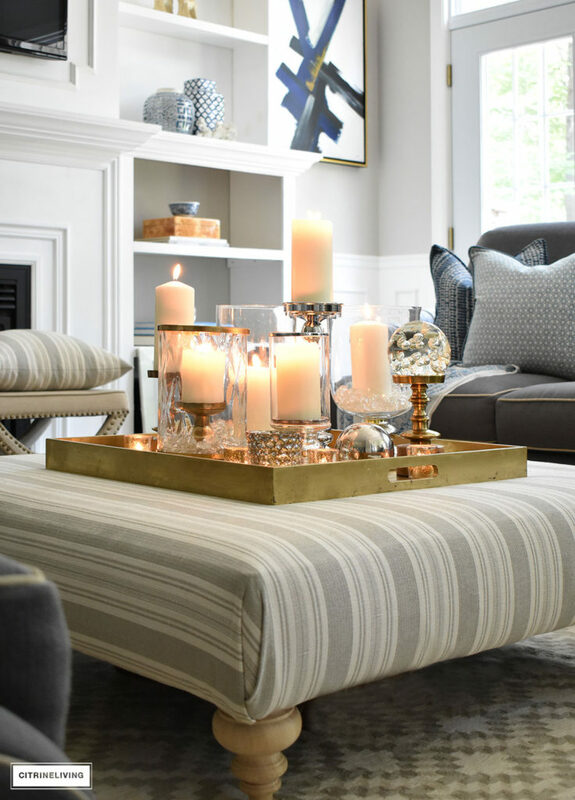 One of the other areas that I’ll change from season to season, is our living room ottoman. I’ll always use a new accessory I picked up and add it to the mix, or add a new design book. But truth be told, I get stuck in my decorating ways, and sometimes when I love something so much, I won’t change it more than that. 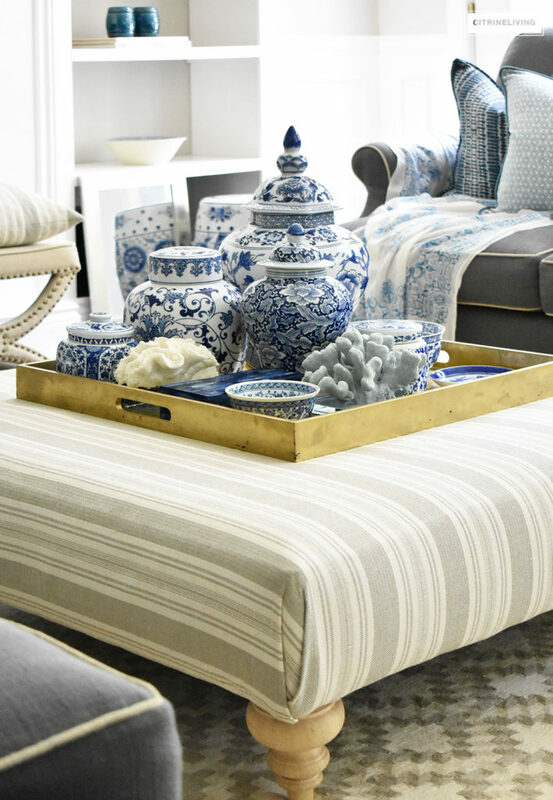 So today’s post is exactly about that : 3 ways to style your coffee table or ottoman. I felt it was time to see what options I could come up with… leave me a comment and let me know which one you think I’m keeping for now! It’s really funny that I haven’t used it as a grouping on our ottoman until now. But I can tell you, I am LOVING this look. 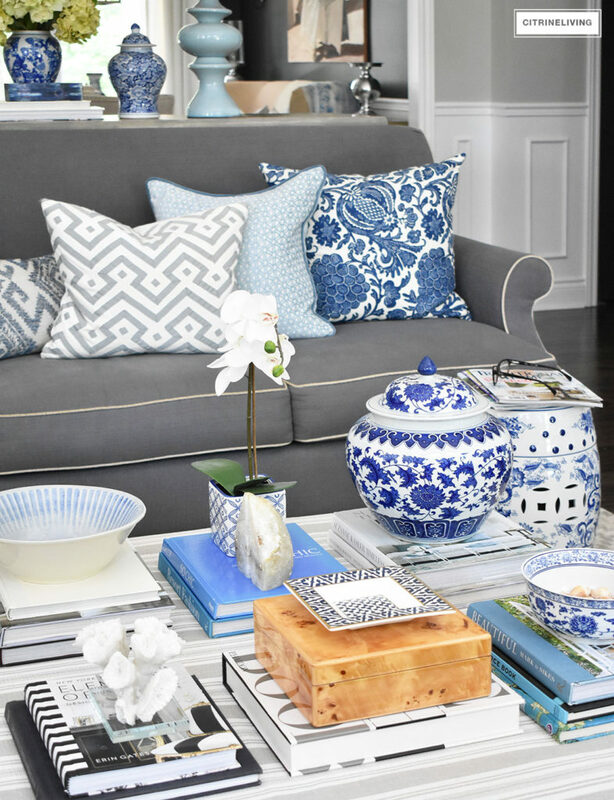 I could live in a house that’s entirely blue and white! And since we’re in the thick of Summer, what better arrangement to be using? 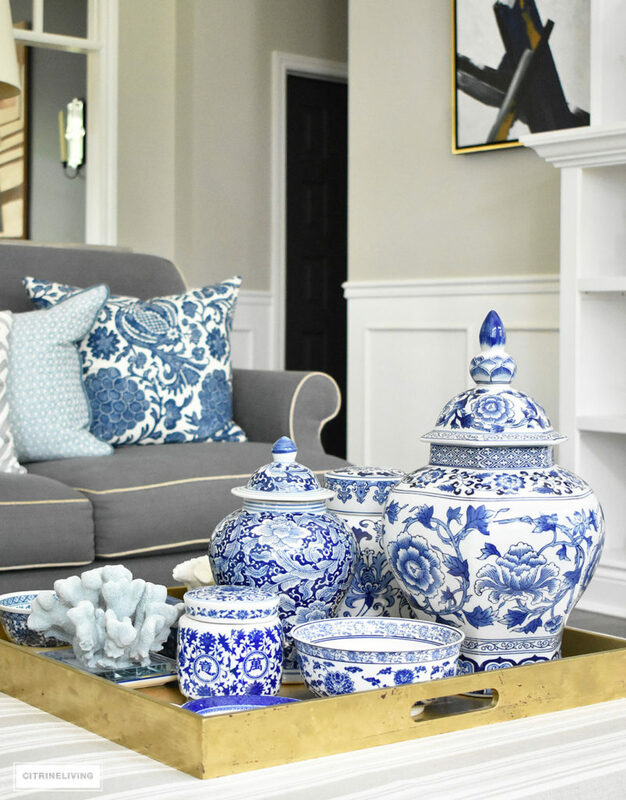 To see how I have our ottoman styled from my Summer Home Tour, click here. 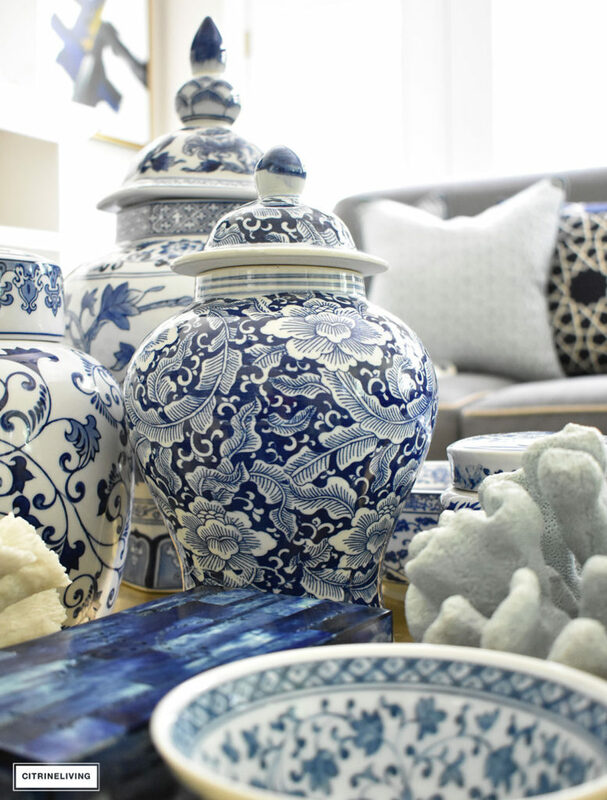 Many of my pieces I’ve picked up here or there, some form vintage shops, some are ‘borrowed’ from my mother’s collection (yes, I know, they’re going back soon), many I’ve scored in Chinatown, and others from different retailers like HomeSense (or HomeGoods), Pier 1 or Bombay Company. There is just something magical that happens when I see all these beauties corralled in one place. To add dimension and interest andto play up the look, I’ve added some beach inspired coral, sand dollars and shells. 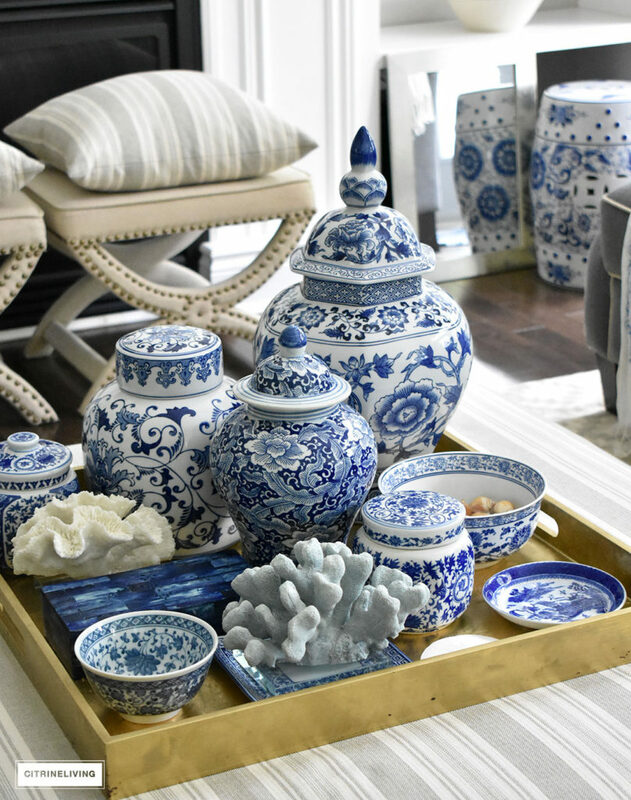 Not everyone collects blue and white, or has enough pieces to group together like this, but the idea is to display a monochromatic collection – a group of accessories and vases within the same color palette. 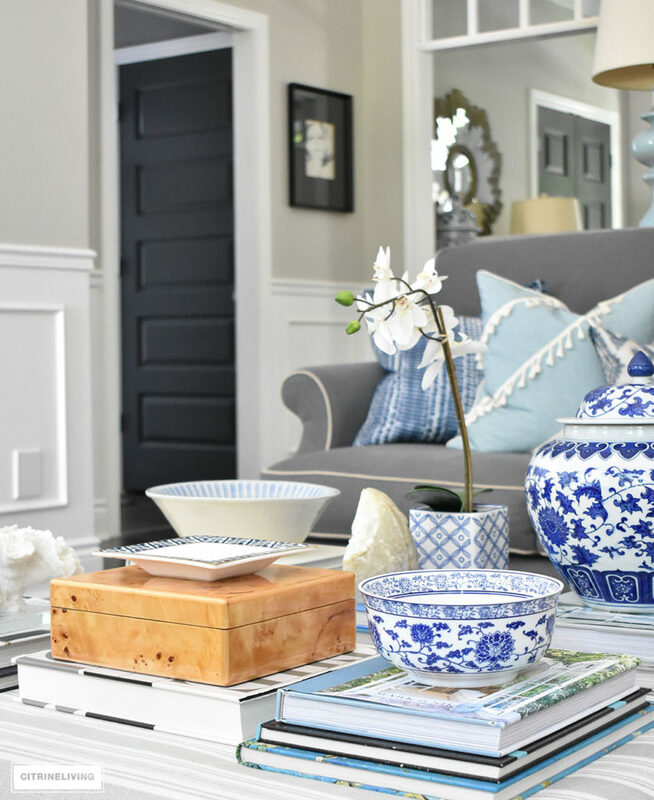 Look around your home and gather items that are within the same color family – even blue and green can work for this look, because they’re both cool colors. 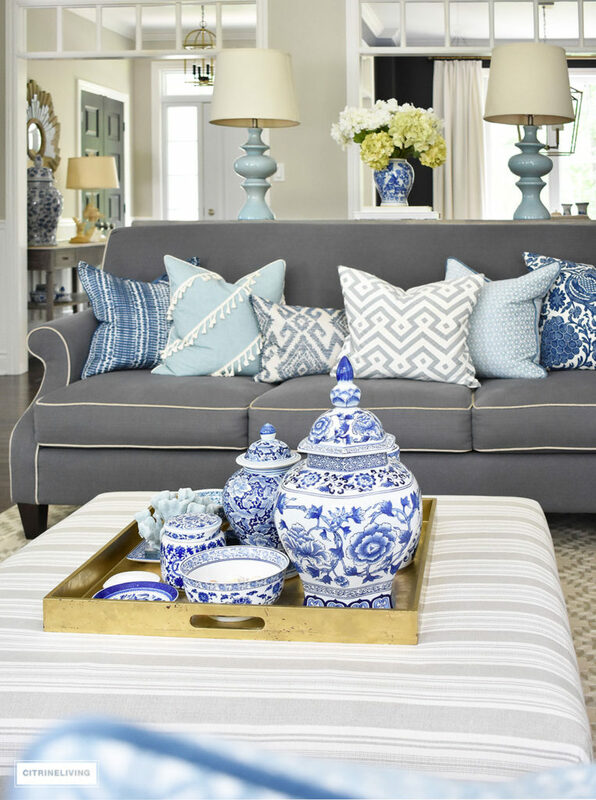 Or, maybe you want to stick to a vibrant palette if you have some brightly colored pieces around your home. 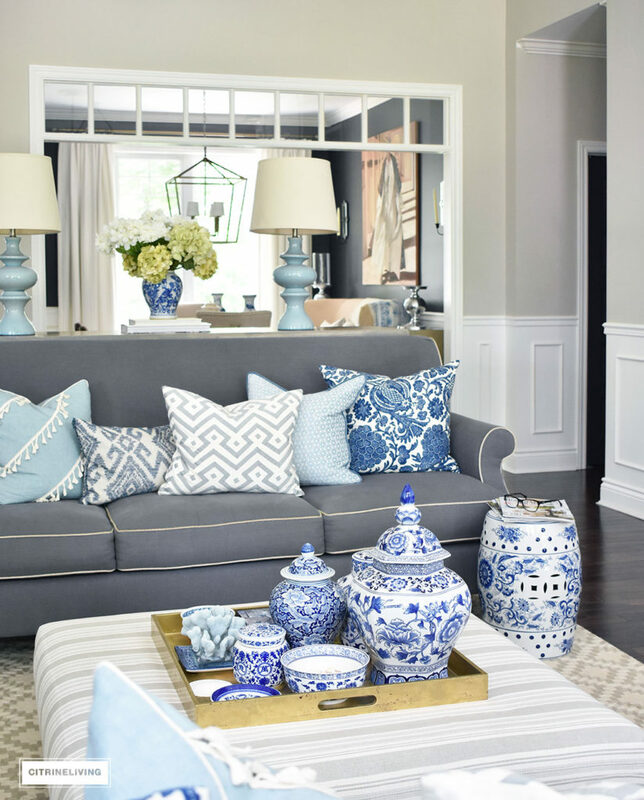 Whether it’s one color, or two or three, it’s important to group things that are similar for this look. 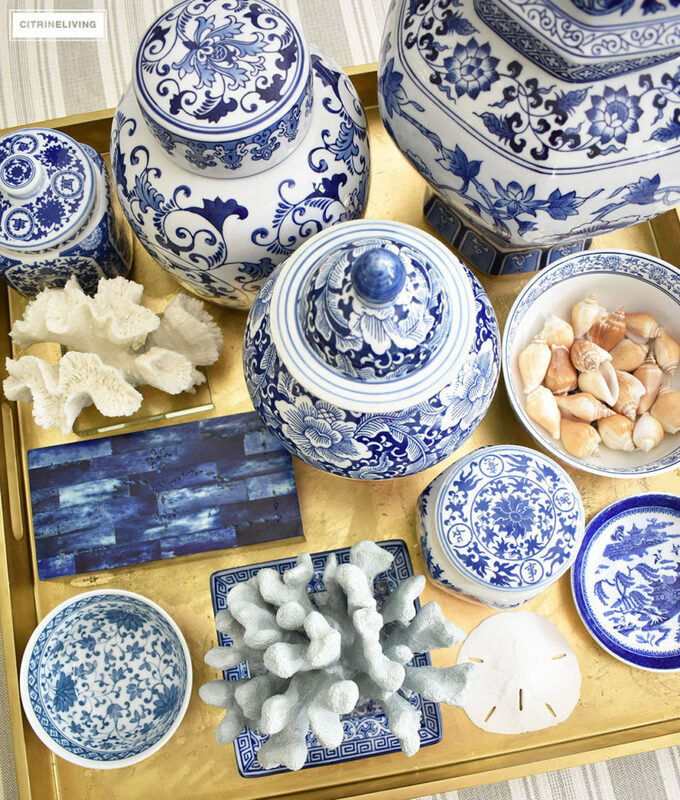 Then add in three or four other objects to break it up – like I have with the coral and other accessories. Before we even go any further…please make sure that if you’re lighting candles like this, NEVERleave them unattended, or even think of lighting them with kids or pets around! This is an ‘adult only’ party, and even then you have to be careful haha! Seriously though, this is look is so easy to pull off and it can work any time of year. The best part, is it looks as beautiful when the candles aren’t lit. Keep the lighting for when it’s just a quiet evening. Or, use this as a tablescape centerpiece, where it’s out of harm’s way. 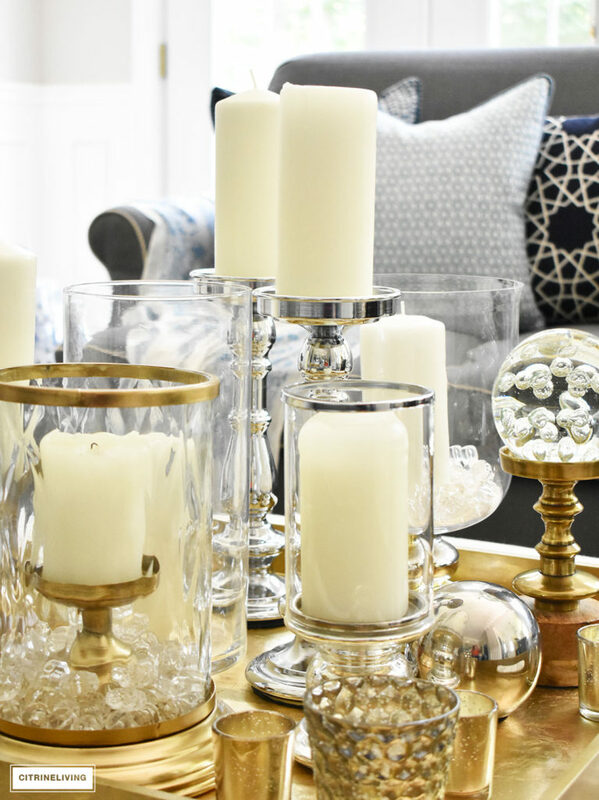 Everyone has candleholders and everyone has glass jars or containers of some kind. 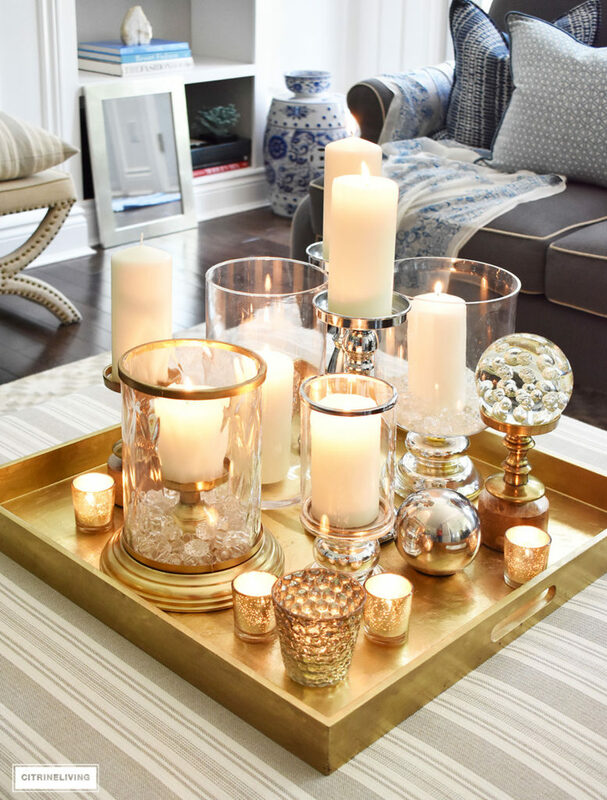 Be creative and use things you have around…mason jars, glassware – even wine glasses with tea lights can work for this look. 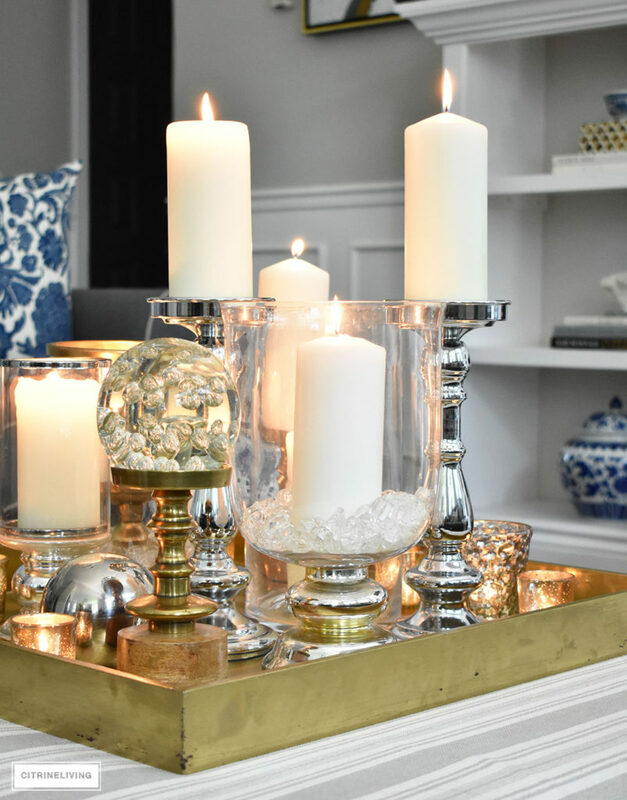 Mix them in with tall candlesticks – I used different metals mixed together, but you can use any kind you like. 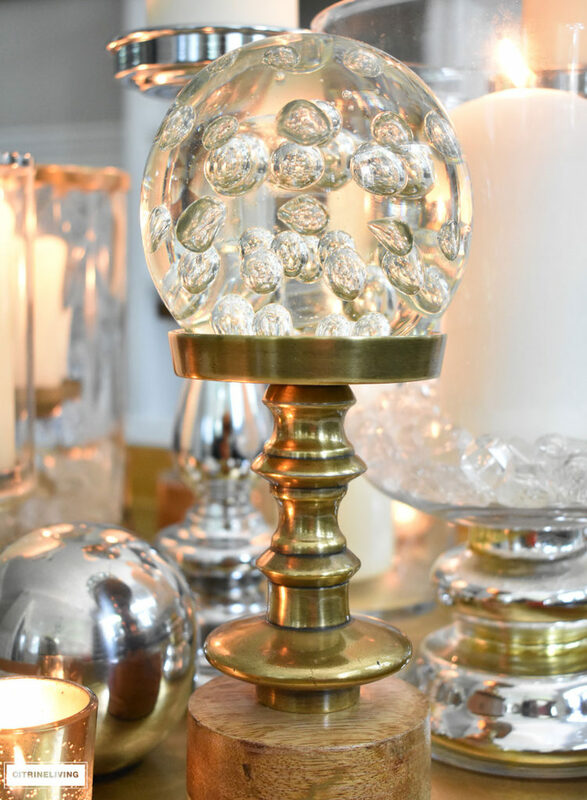 Add in some reflective accessories like this glass sphere that I topped off this candleholder with. How gorgeous does that light look bouncing around in there? 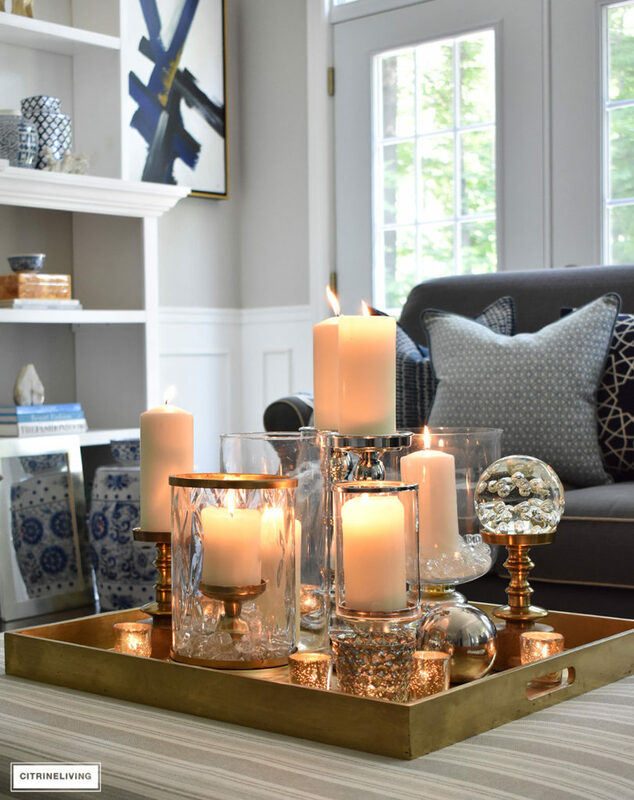 Small, lower votives are a key element to this look as well. If you don’t have any, use lowball or juice glasses – I know you all have those! I didn’t have time to retouch out my reflection and of course, I’m wearing a red t-shirt…try to ignore it if you can! Aren’t these beautiful just like this? 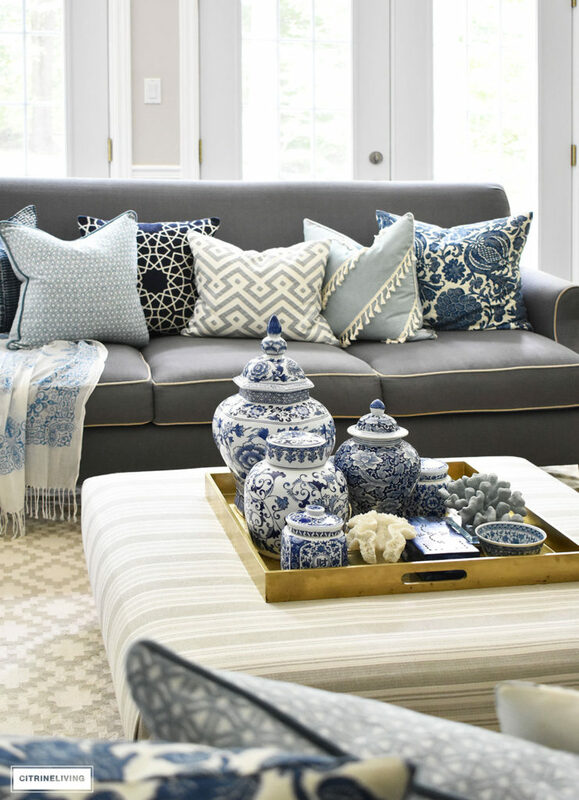 When arranging a grouping like this, make sure to use varying heights for maximum effect. 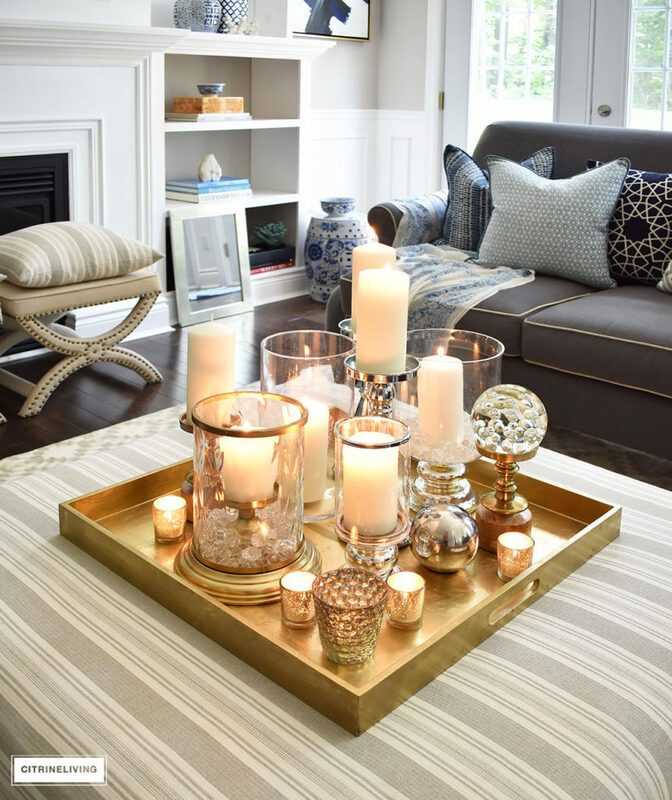 Keep them as close together as possible and fill in the empty spaces with the smallest candles. FILL IN THE HOLES WITH LOW ITEMS. 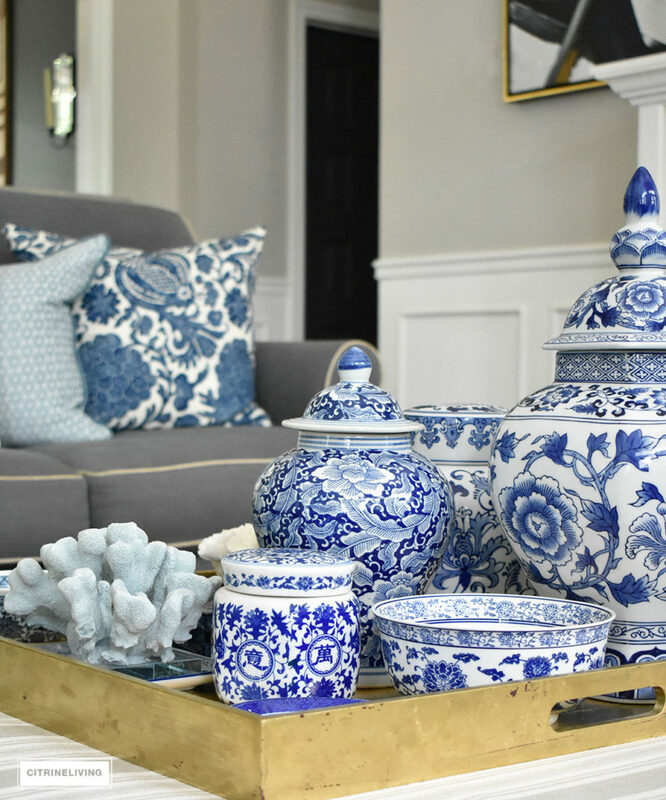 I have to use blue and white here, so I started this look with a couple of my newer pieces, like the bowl and ginger jar. 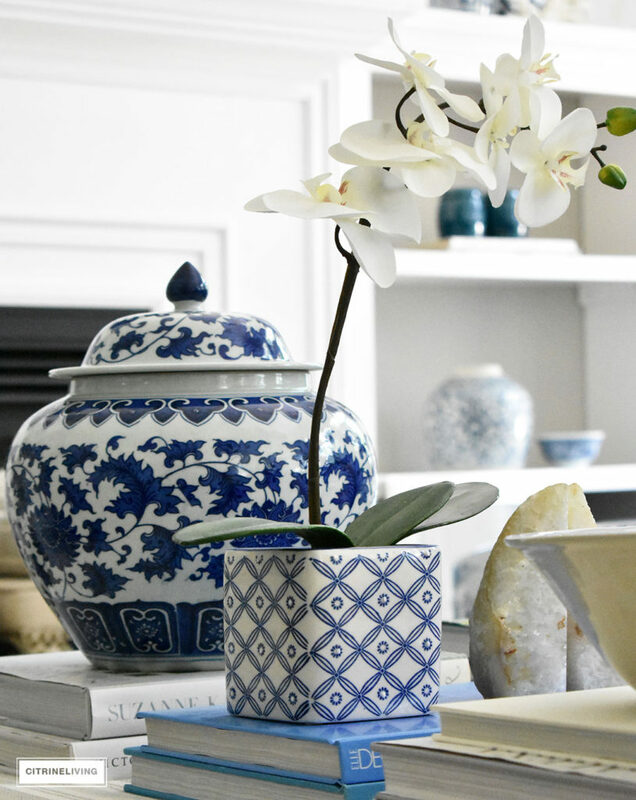 I love this faux orchid – it looks so real and goes anywhere it gets set down. 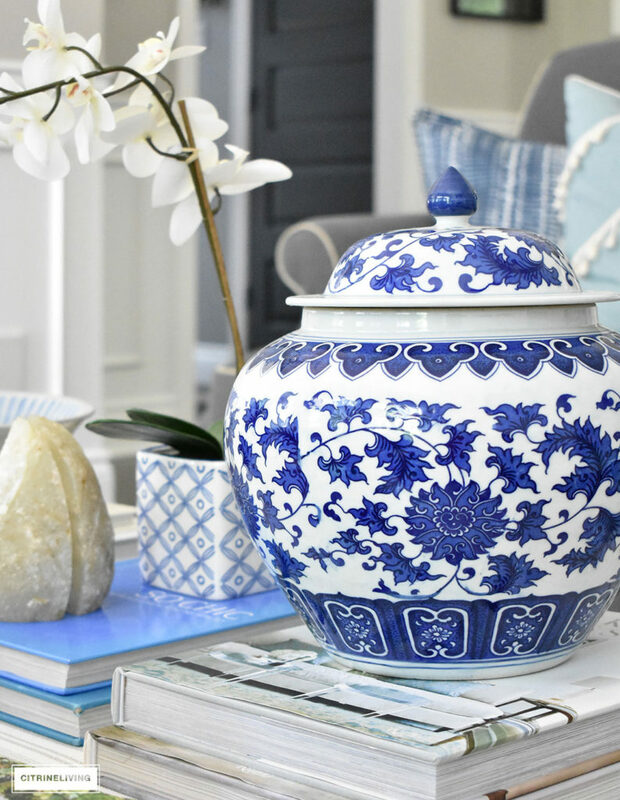 Always a classic piece in any home, and well, the blue and white pot is too cute. 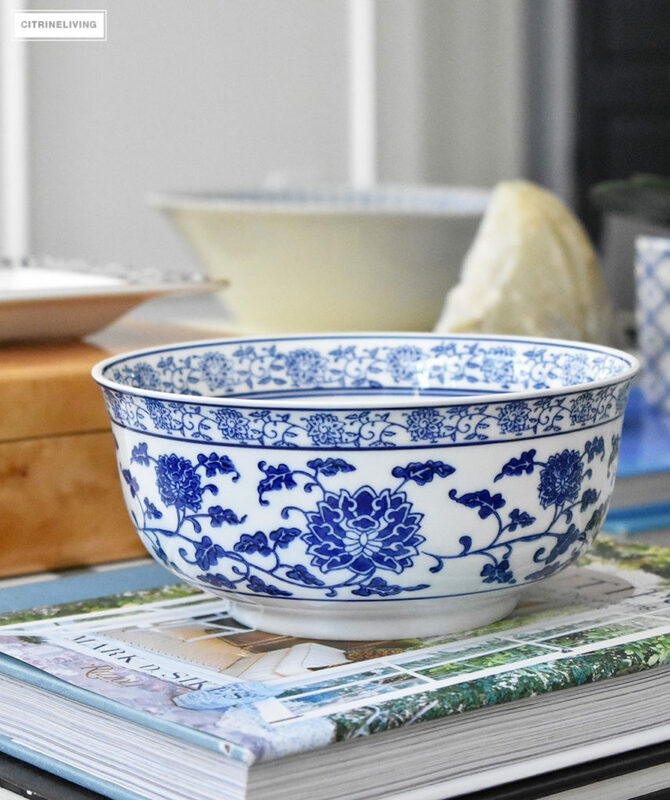 Bowls, agate bookends, decorative lacquer boxes and small dishes are all things I love to collect and have multiples of. Arranging them atop a stack of beautiful books (design and decorating books in my case) is a no-fail way to showcase your beloved beauties. 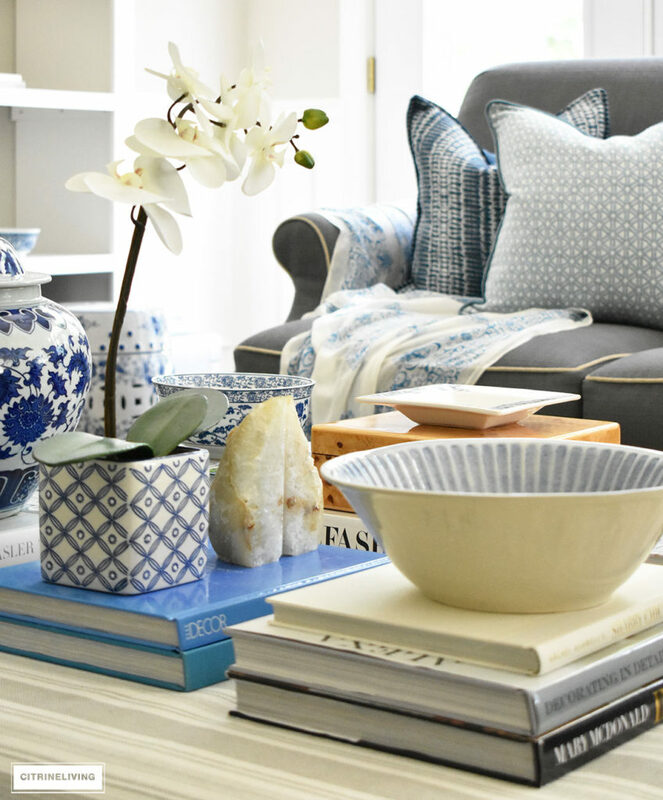 I use this basic styling trick everywhere in our home and it’s the easiest way to show off the pieces you love. Anything that’s raised up on something suddenly has more importance and your eye is drawn in. If you don’t have a lot of books, you can use magazines to start – fashion magazines, decorating magazines or National Geographic would make a fabulous statement with those gorgeous yellow spines. Try to keep the look clean and use magazines with thicker spines, not the stapled kind! 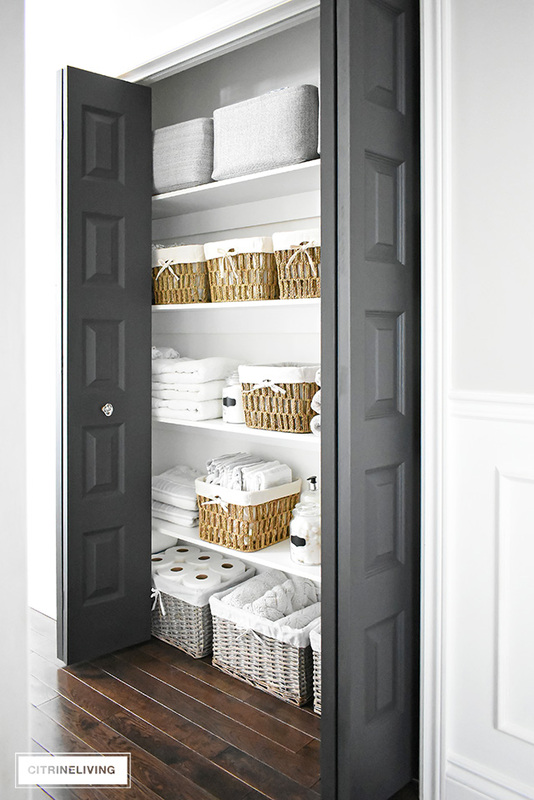 You want to avoid anything that may look cluttered. I arranged these stacks in an evenly spaced grid-like pattern, and I covered as much space as possible for strong visual impact. 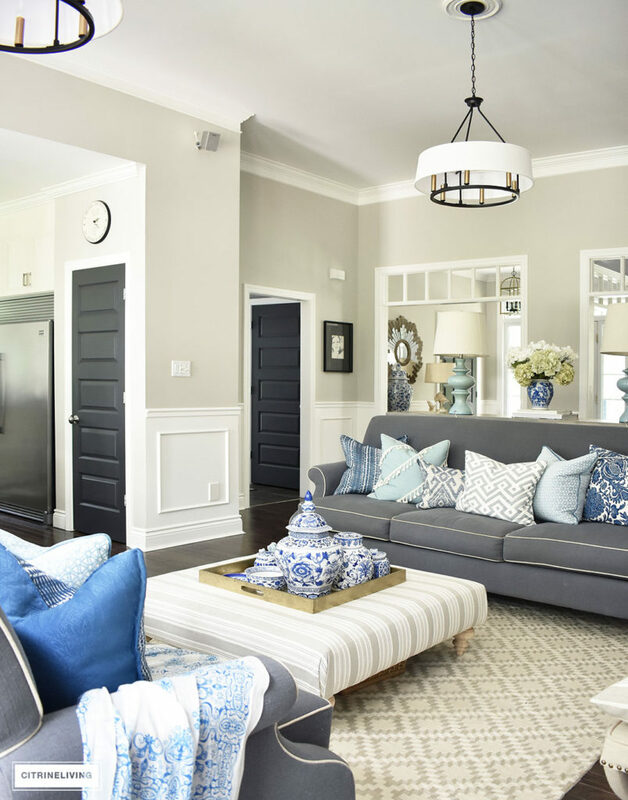 You can play around with your color palette – mine uses black and white, different blue tones and some green, with a touch of brown – all which are neutrals. 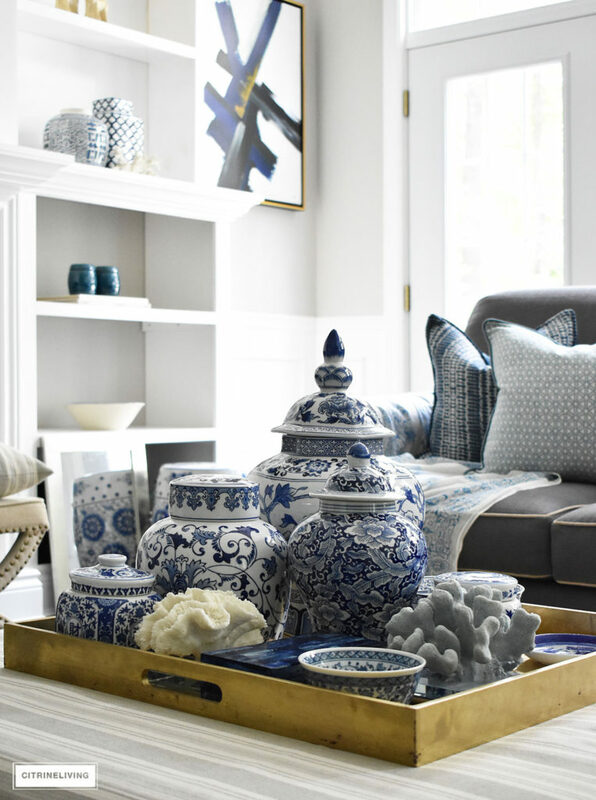 This idea is create a ‘collected’ look of your favorite things. 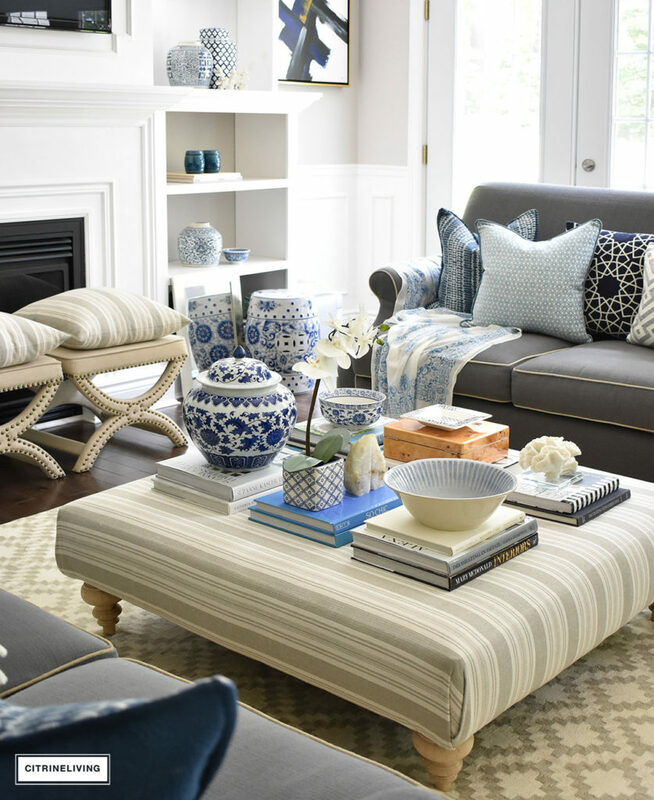 Just make sure that when grouping items together, you have a cohesive color palette, to avoid a cluttered look. 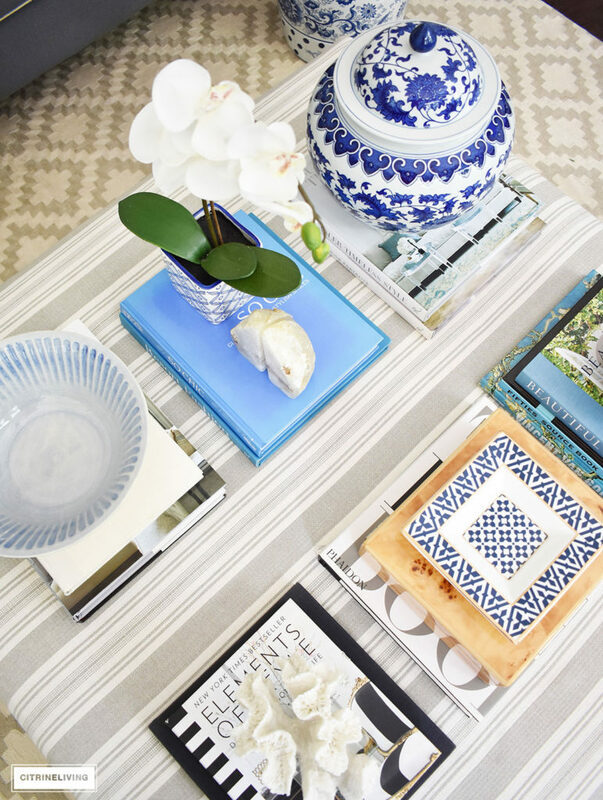 Keep in mind that whatever you’re using will add color – so the top book is something you want to pay attention to. « MY FAVORITE NEW SUMMER PURCHASES YOU NEED TO SEE! Love them all!! Tam this is such a helpful post! Great ideas and tips that we can use! Gorgeous!!! Love them all. I always come away with some new idea after reading your posts. ? Gorgeous! I’m a blue and white lover also, so that was my favorite but all three were beautiful. 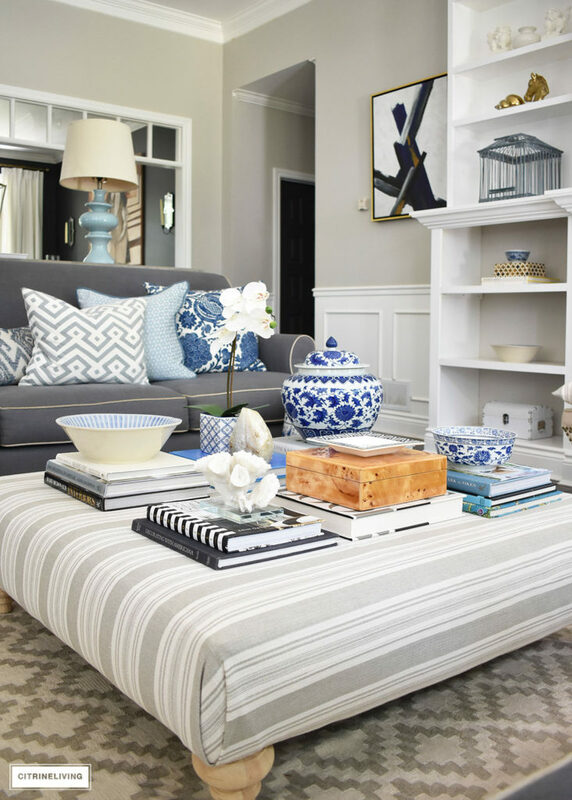 I’ve been struggling with my coffee table and the scale of the items, I believe I will try the third look! 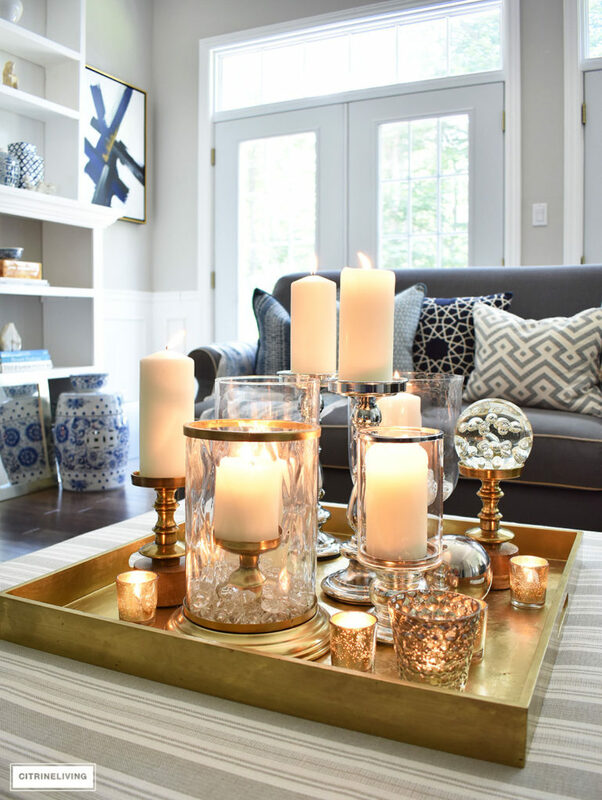 I love the glass / metal and candles. I think they look beautiful for anytime of the year. 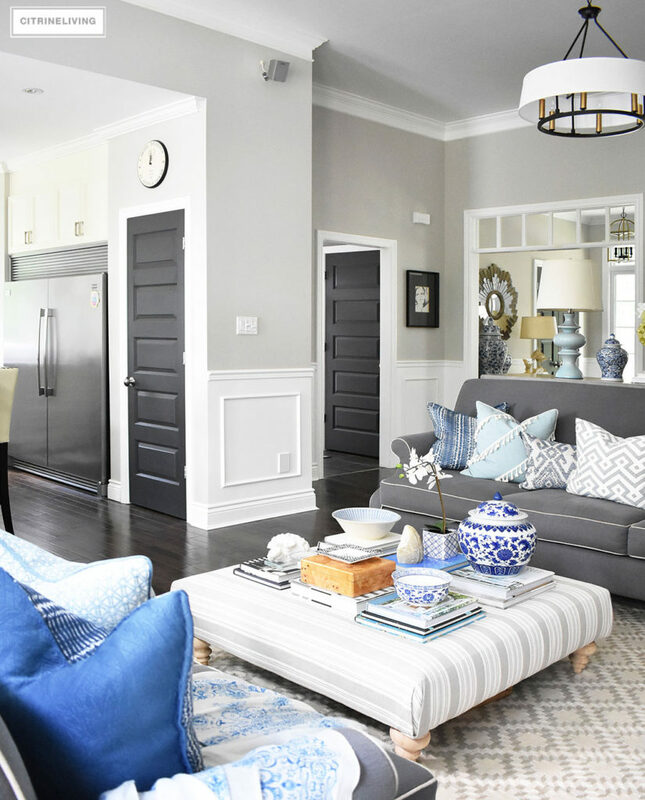 I think your pictures and tips are very helpful and create you to imagine things that you own and love in different rooms in your home. 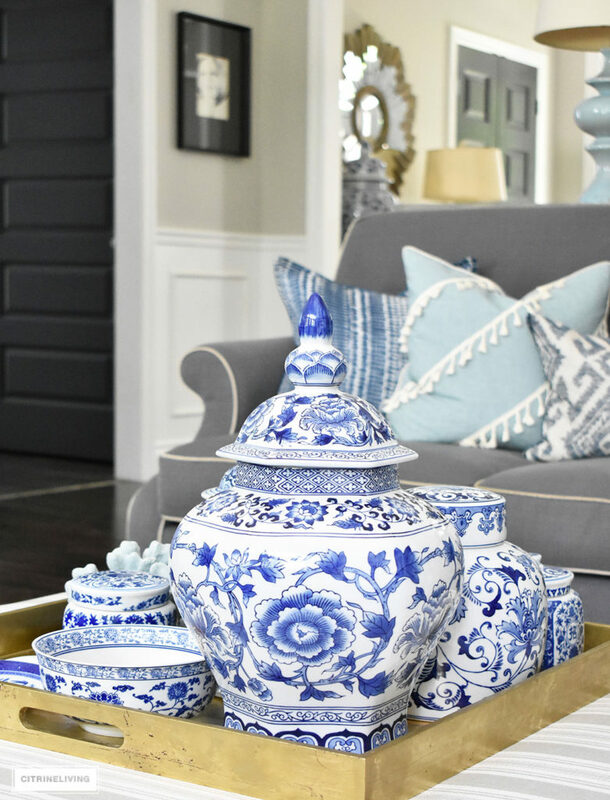 I am currently in the process of redoing my home relative to decor and I am finding I use things all over the house and fall in love with them all over again. What I would like to see is some simple but effective decorations for fall and Christmas. 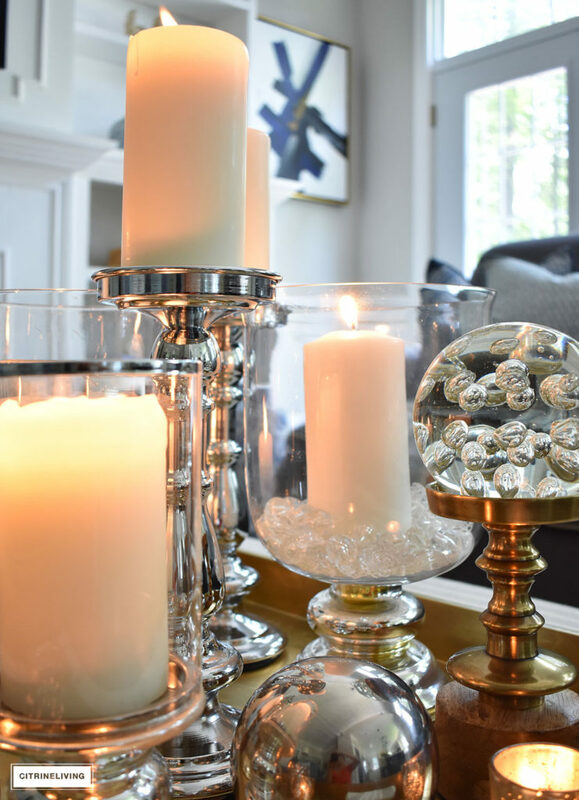 How can we make a major statement or say, happy holidays that we can enjoy all season long. Perhaps 3 table setting for Christmas Breakfast or Lunch. 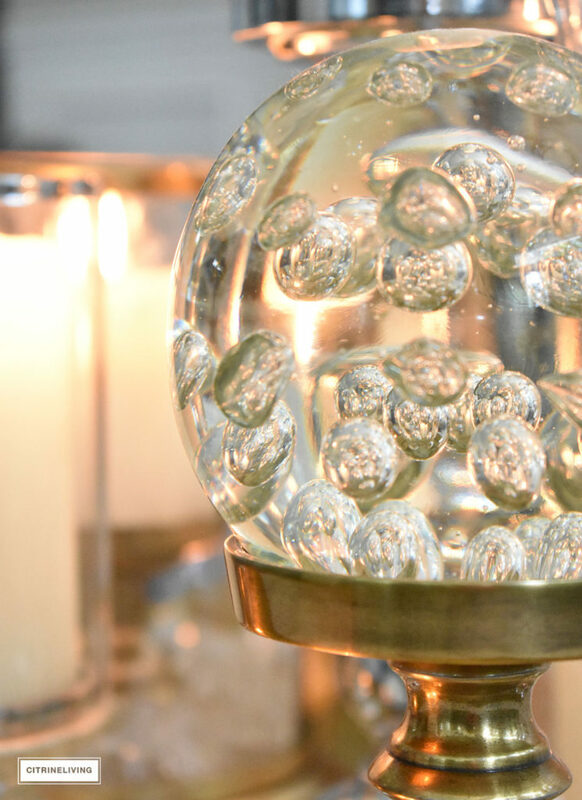 Simple ways to show the spirit all through the house. Thank you and I look forward to your next email. 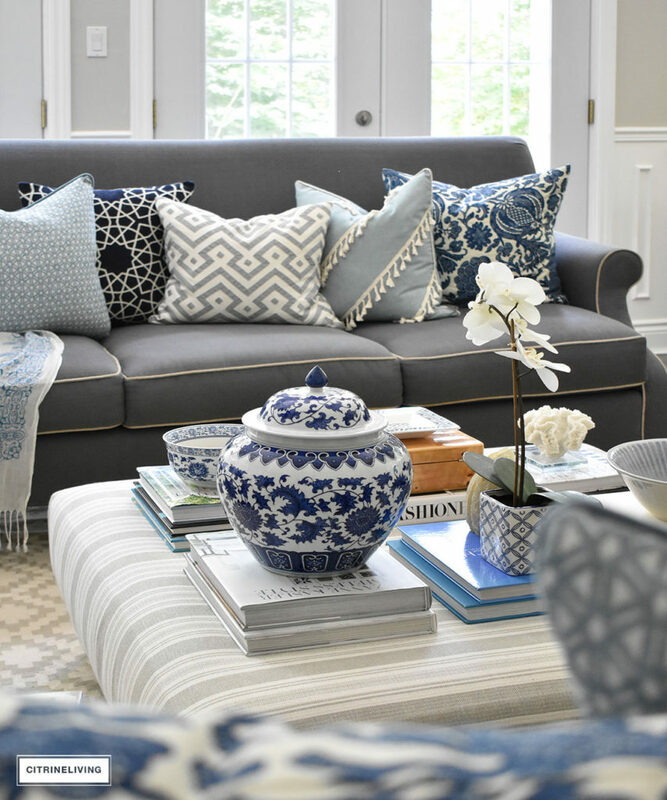 I too love the blue and white! Have it all around my house in many different shades. Also have the orchid in the blue vase. Your home is beautiful, love it. Great choices,easy to try them all. Love everything about this post. May I ask what color are your wall. Thank you. I am a blue lover just like you. Almost my entire house has some shade: teal in my bedroom, navy/cream/beige in my living room and kitchen, navy/gray/red in my son’s room, aqua/pink in my daughter’s room etc. 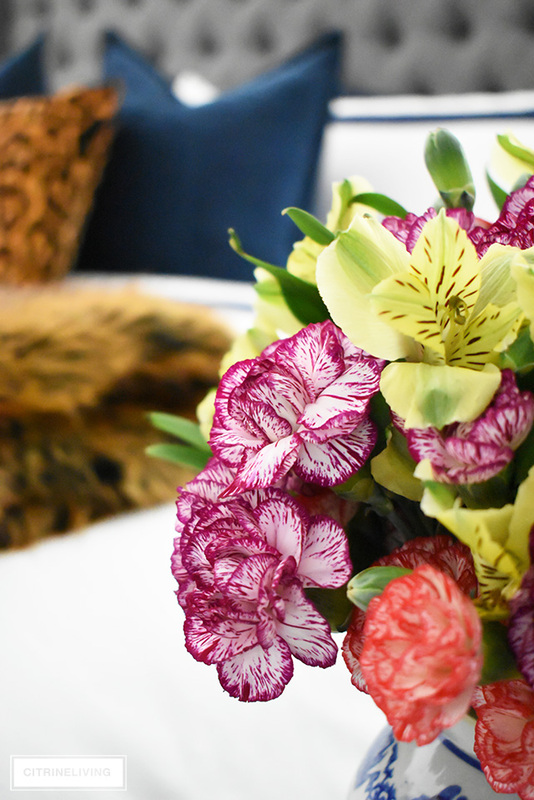 Your first arrangement really spoke to me. But your second one—wow! 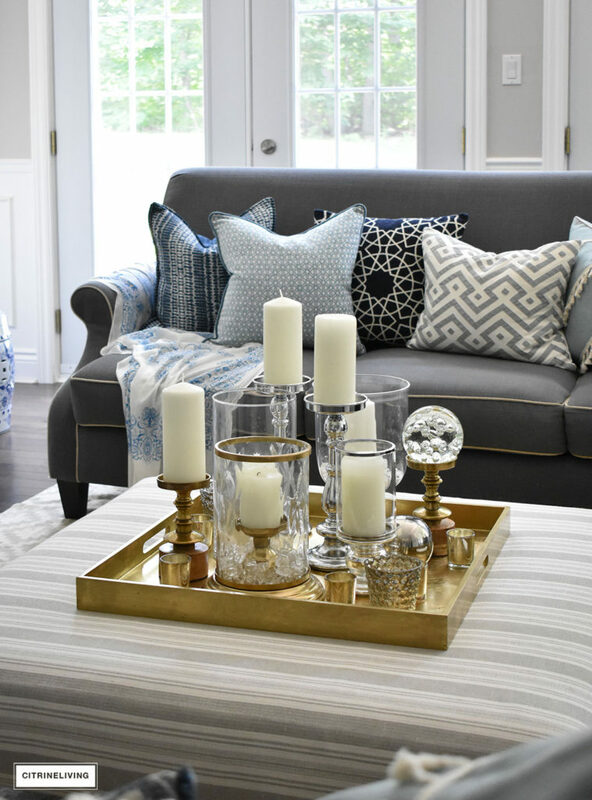 The way the light is bounced off the clear glass as well as the mixed metals is genius. In fact, easily a Christmas time arrangement without being literal. A few paragraphs down and you mentioned the same thing-ha! 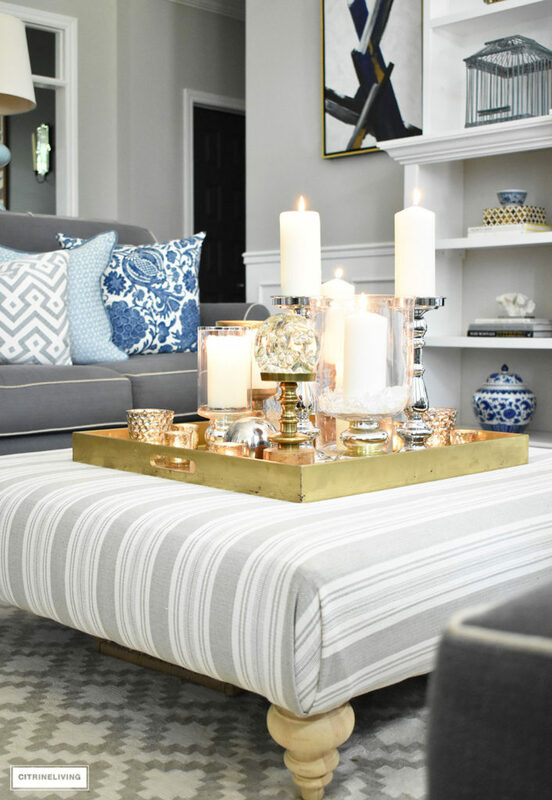 I Love it, and now want to create something similar for my dining room table (small house, no room for coffee table or ottoman) Funny too is that you mixed metals–a look that I definitely cringed at a few years ago, but have totally embraced now. It used to be such a no-no– especially in regards to fashion. That orchid is really convincing too. Love the container. I could see this working in a lot of places in my home. I really enjoyed this post. I especially like the formula behind the beauty-thanks for sharing your tips. 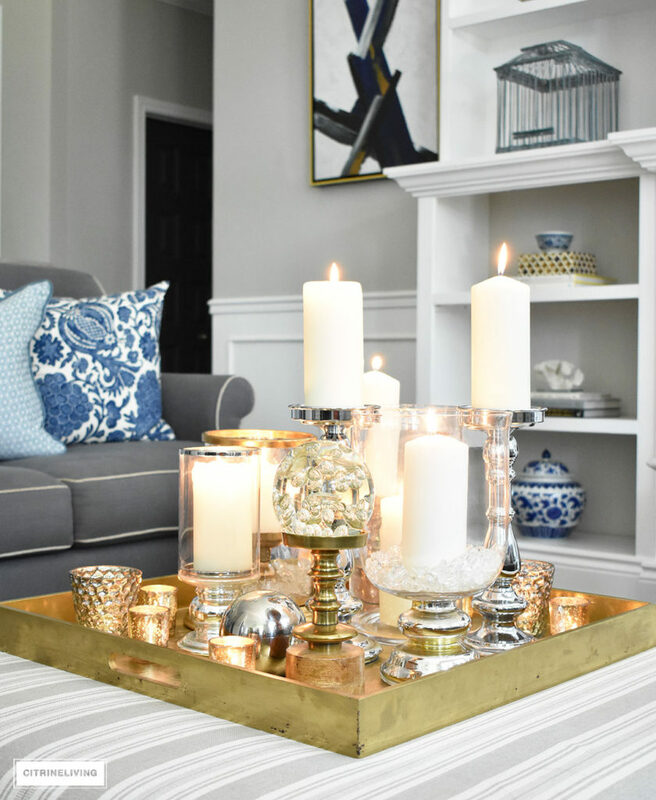 It really breaks it down into something I can think about when trying to style my home! I love this room. 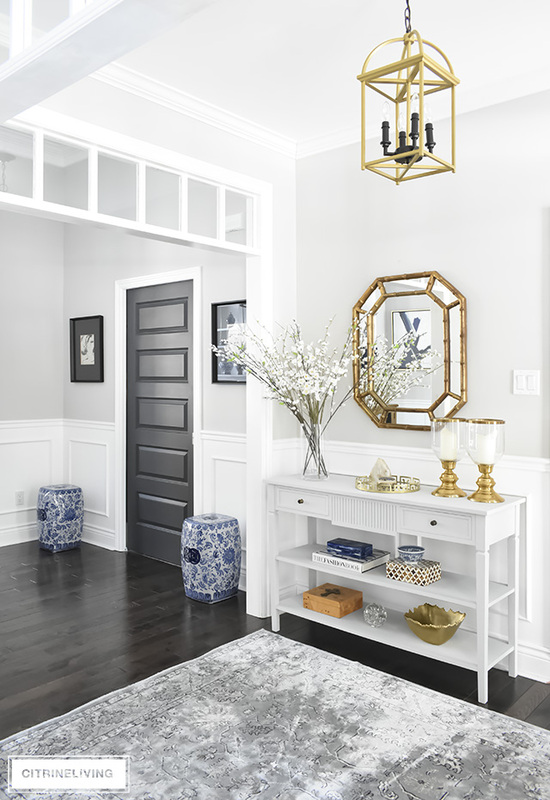 What paint colors did you use on walls, trim and door? Wonderful post, beautiful pictures and items. My one problem is that my coffee table in the living room is large and round. So I have had to use round trays or wood circular items. Any suggestions on if I could use a rectangular tray??? 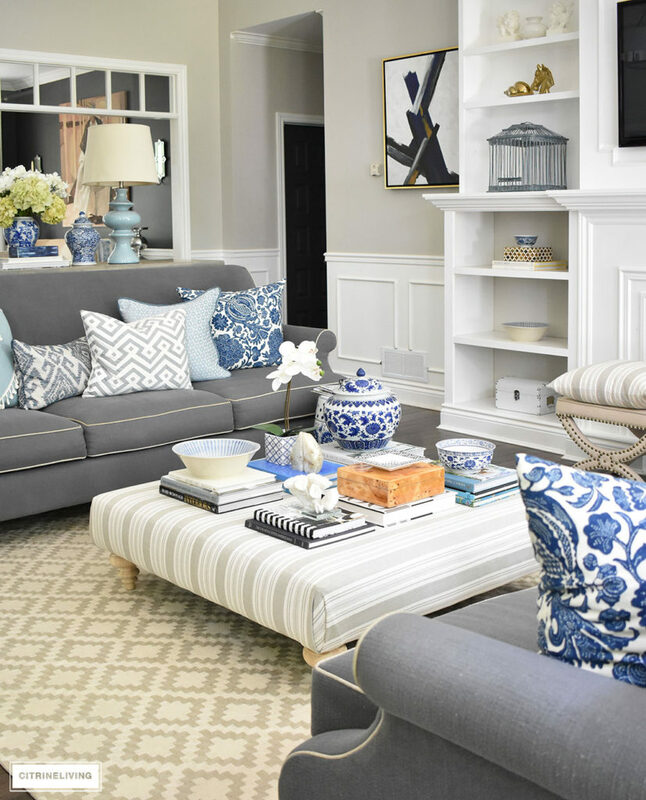 I love the blue and white and have used it in my home for years. 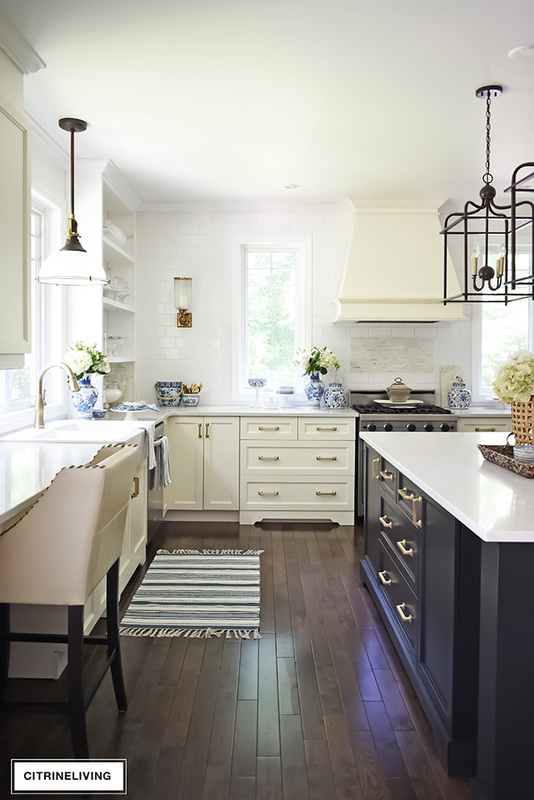 It is so helpful to see different ways to style a space and get ideas. 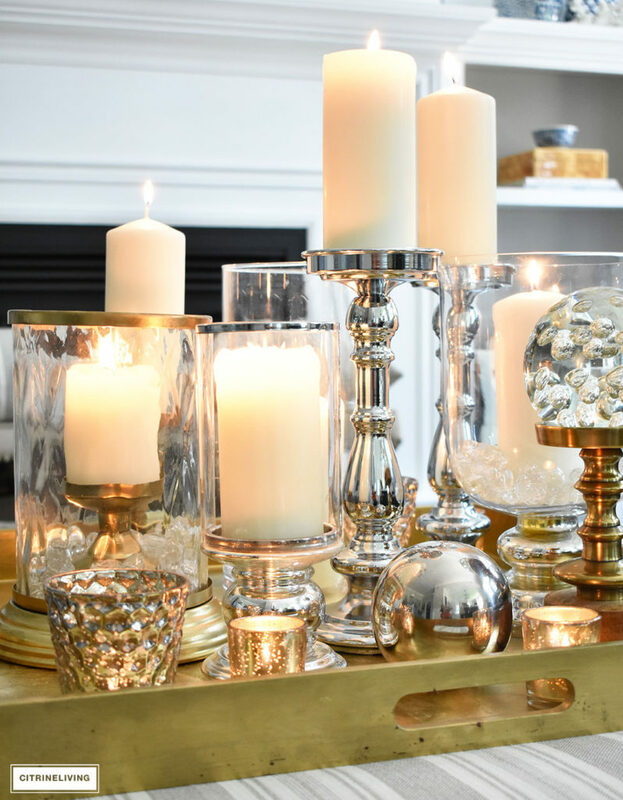 I especially loved the candle collection. It is stunning!! And the gold tray is awesome. I have been looking for one like that for awhile and would love to know where you got it. Thanks for all the wonderful tips! Can you please let me know what the exact paints are. Everything is perfect, I could move right in! That black hole ( the TV ) above the fireplace, is distracting. 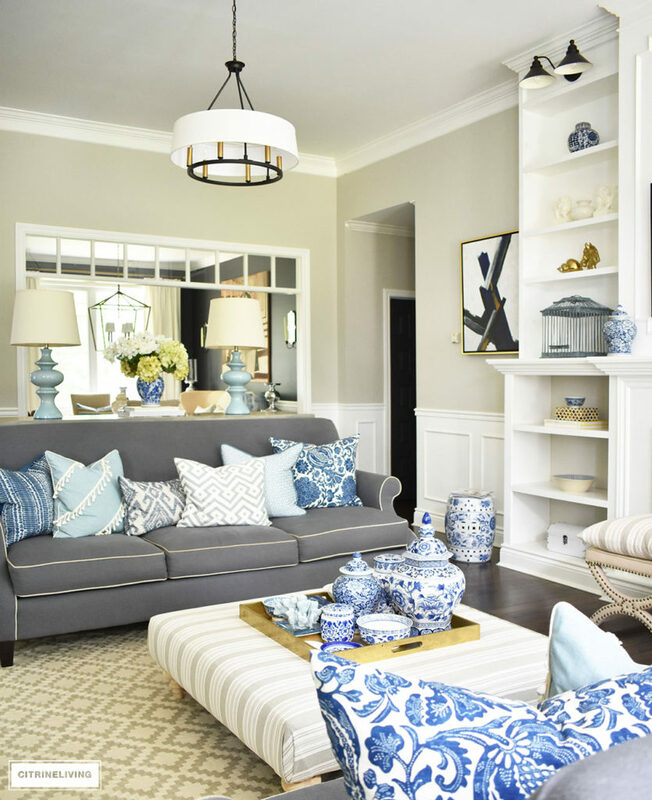 Need a thin white Asian frame, with a blue willow motif, to cover it! Wouldn’t that be nice to have haha! Thanks for stopping by! !